Backgammon is a fantastic game, easy to learn and has elements of skill and luck which makes it possible for total novices to beat expert players! 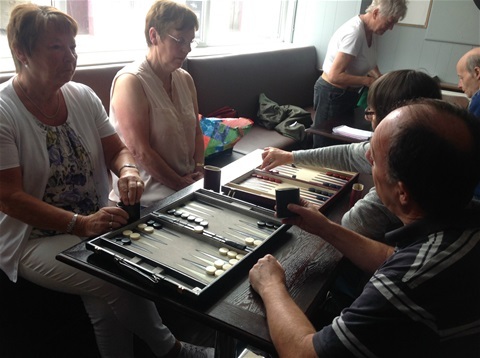 The backgammon group meets every Tuesday morning at 10.30am and runs for between an hour and 90 minutes or so. The aim of the group is for members to learn and improve their backgammon play, and to engage in friendly competition. Jules, our organiser, has been playing backgammon for over 30 years and has significant tournament experience gained mainly in the 1980's. Jules is keen to get more people playing backgammon and taking them on to an intermediate or expert level. Please note that this group is as much for complete beginners as more experienced players.